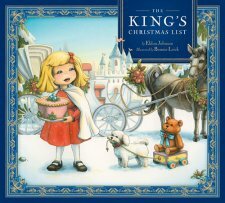 The King’s Christmas List is a wonderful tale of a little girl called Emma and her dog shu-shu who enter into a magical world where they receive an invitation to attend the Kings birthday party on Christmas. They take the King a cake they baked themselves but on the way meet a lady and her child and give it to them to stop them being hungry. As they continue their journey they meet a poor family with a small daughter who has lost her toy and Emma gives the girl her own teddy bear. They arrive at the party and Emma is curious as to why everyone gives presents to each other but none to the King considering it’s his birthday. When she asks the King to explain the people she met on her journey appear at his side as angels and he explains to Emma that the greatest gift is one that comes from the heart. By giving gifts to those in need Emma had in fact given him the best present of all. An excellent story for teaching children the real meaning of Christmas and a delight to read. Beautiful illustrations by Bonnie Leick accompany the story and really add to the feel of the book. A wonderful Christmas book that all families can enjoy.